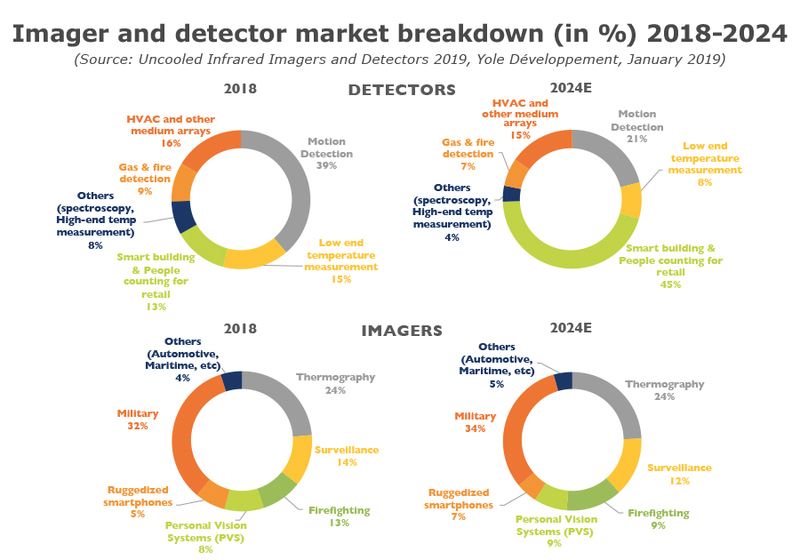 "The uncooled IR detector and imager market looks promising, with annual growth of 7% in value over the 2018-2024 period. For microbolometers, numerous commercial applications have driven the imager market growth. These include thermography, surveillance, personal vision systems (PVS) and firefighting. Most noticeably, shipments exceeded a million units in 2017, mostly due to FLIR’s Lepton core and SEEK Thermal’s success, heading to two million units in 2021! 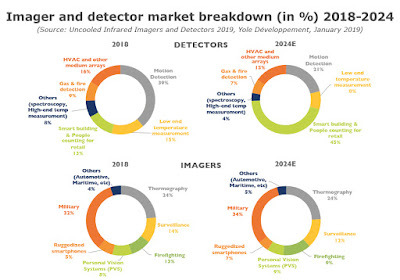 The uncooled IR imager business is still driven by commercial markets, which will continue to expand quickly, with a compound annual growth rate (CAGR2018-2024) of 15.8% in shipment volumes. These markets will represent 93% of all shipments by 2024. Thermography will have a 9% shipment volume CAGR2018-2024. This application is a sure thing for the microbolometer market, with IR imagers used here for industrial and commercial applications including home diagnosis and hot spot identification. Firefighting is an attractive opportunity with 20% shipment volume CAGR2018-2024. There is a very large potential market, with 37 million firefighters worldwide." LG Innotek announced that it is promoting its thermal imaging infrared camera module business. This sounds exciting as LG is the leader for visible camera modules and is Apple’s supplier. Amazon introduced 9 cashierless stores in 2018, which include hundreds of cameras including infrared sensors. 3,000 stores are expected by 2021. Following the success of the CATS60 smartphone, Caterpillar launched the CATS61 with increased functionality. In two years, it shipped more than 500,000 units of the CATS60. Leonardo DRS launched its TENUM 640 core, based on a Wafer-Level-Packaged VOx microbolometer with 10μm x 10μm pixel size, making it the smallest available anywhere. How will the new Chinese makers (IRay, HikVision, Dali, Guide, etc...) be inserted into this landscape please ? Thanks !